For Climbing, Sitting and Watching Kitty Style! 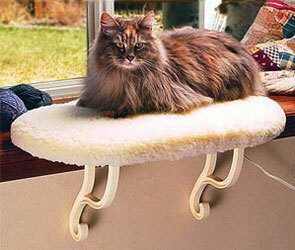 Cat perches are great way to allow your pet to explore their territory in a whole new way! Cats love being able to sit somewhere high up where they can get a good view of what's going on around them. In the natural world, they would often spend their time climbing trees and bushes. In our homes they might end up sitting on the back of the sofa, up on the mantelpiece or even on top of the wardrobe! So by buying cat shelves or a cat window perch for them, you are allowing them to express and satisfy these natural feline instincts! Another option is to buy special cat trees or towers, but these can take up a lot of floor space, so a perch or shelf system can be a really convenient solution. There are two main types of cat perches, ones that fit on your wall and others that fit on your window ledge. I think this is a beautiful and elegant design that will not only delight your kitty, but will look great in your home as well. Many people like the idea of cat shelves but worry that they might look ugly in their living room. Well, that's certainly not a problem with this stylish solution. Just imagine what all your kitty owning friends will say when they see one of these on your wall! I think they will all want one! Out of all the different types of cat perches I have seen, this is definitely my favourite one and I'm not surprised it's even won an award. This design comes in a range of soft contemporary colours and the strong and sturdy shelves are covered with replaceable faux sheepskin pads for your kitty's comfort. Why not have a look at this great little video and see for yourself just how much your feline friend might love exploring your home from a whole new angle, thanks to this beautiful and unique cat shelf! We all know how much kitties love to sit and look out the window for ages don't we? They love to watch the birds or see which other cats might be wandering into their territory! So what do you do if your window ledge is too narrow for them to sit there in comfort and safety? The answer is that you can get them a specially made cat window perch! There are lots of different choices available but I thought this one called the 'Lectro' Kitty Window Sill Perch is one of the most attractive and elegant designs I have seen. It must be wonderfully comfortable as it's covered in orthopaedic foam, with a washable faux lambs wool cover. You can even choose a heated option which simply plugs in to your normal electric socket. I think that would be lovely for your kitty during those long cold winter months, especially if they are a bit elderly or have a touch of arthritis. So would your feline friend like to explore their indoor territory in a way they haven't experienced before, or to be able to relax in comfort while watching eagerly out of the window? Then click through on the pictures above and take a closer look at these great designs of cat perches and cat shelves.